India's Prime Minister Shri Narendra Modi's reply to the motion of thanks on the President's Address in the Lok Sabha on 7th February 2019. The identity of this government is for honesty, for transparency and to restrain corruption: Prime Minister Shri Narendra Modi. After going from here we are going to give an account of the work to the public. I wish you all good luck in the coming elections: Prime Minister Shri Narendra Modi. From now on we all have to go to the polls and the people have to give an account of their work: Prime Minister Shri Narendra Modi. I congratulate our new generation who is going to vote for the first time in the Lok Sabha elections. I hope this generation will contribute to giving a new direction to the country: Prime Minister Shri Narendra Modi. We are not those who run away from the challenges. We face challenges and work to fulfill the aspirations of the people: Prime Minister Shri Narendra Modi. This government is known for taking action against corruption and crackdown on corruption is the focus: PM Narendra Modi. This government is known for its honesty and transparency: PM Narendra Modi. In order to fulfill the aspirations of ordinary citizens, we are engaged in full strength: Prime Minister Shri Narendra Modi, in the Lok Sabha. In hating Modi, the Opposition has begun to hate the nation. That is why their leaders go to London and do press conferences to show India in bad light: PM Narendra Modi. Some people start criticizing the country by criticizing Modi. Nobody should criticize the country: PM Narendra Modi. Today Kharge said that Modi, who speaks out, the same President said here. This means that you believe that you speak something outside and inside and we always speak the truth whether it be a parliament or a public meeting: Prime Minister Shri Narendra Modi. India is seeing remarkable progress in the last four years. 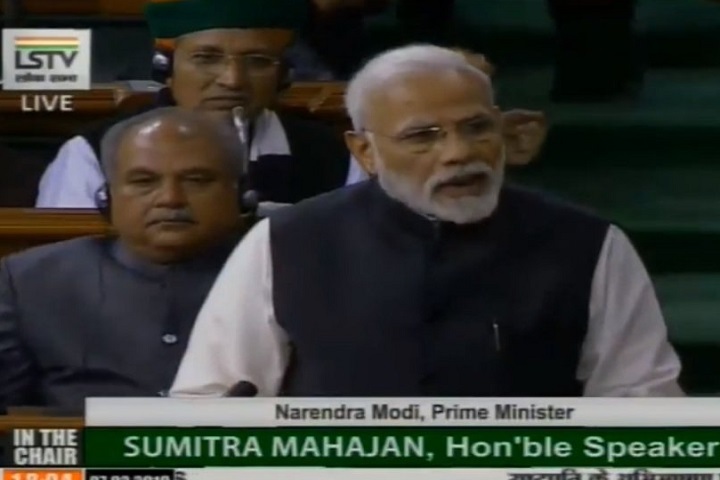 In all spheres, investment, steel sector, startups, milk and agriculture, aviation, India's progress is outstanding: PM Narendra Modi in Lok Sabha. Kharge said today that Modi is ruining the institutions of the country. It was the same thing that the upside-down thief dared the janitor: Prime Minister Shri Narendra Modi. Emergency Thoopa Congress in the country, but says Modi is ruining institutions. Gunda Congress said to the Army Chief, and says Modi is ruining the institutions: Prime Minister Shri Narendra Modi. The judiciary is intimidated by Congressmen. Today the manner in which judgments are being made on the decisions of the courts, never before in history: Prime Minister Shri Narendra Modi. Congress has torn the Cabinet decision, cabinet decisions in the press conference Before raising a finger on Modi, the Congress should know that the remaining four fingers are on your side: Prime Minister Shri Narendra Modi. Section 356 was misused about 100 times by Congress, dropped elected governments. Indira Gandhi ji dropped 50 elected governments alone: Prime Minister Narendra Modi. In fact, the biggest problem with them is that a person born in a poor family is challenging his sultanate: Prime Minister Shri Narendra Modi. Those who say that this is the government of the rich, then I say that the poor of the country are my rich. Poor is my faith, he is my life, I have won for him, I have come here for him: Prime Minister Shri Narendra Modi. In 55 years, sanitation coverage in the country was only 38%, which has increased to 98% in our 55 months. We have worked very fast in our tenure: Prime Minister Shri Narendra Modi. This time, Mahilavalya is going to come in the election. The Health Concepts Society also stays away from adulteration. In the same way, those with a Healthy Democracy will stay away from Mahilavalav: Prime Minister Shri Narendra Modi. After 30 years in 2014, the people of the country chose the government of the absolute majority, and the country knows that when the government is in full majority, then at what pace does the country develop, and now the maternity leave is going on, but this maternity leave is not reachable here. : Prime Minister Shri Narendra Modi. In 2004 the Congress had said that we would make every village digitally. By 2014 the Congress could reach optical fiber network in just 95 villages, our government has broadband connectivity in 1,16,000 villages: Prime Minister Shri Narendra Modi. Congress said in their Manifesto in 2004, 2009 and 2014 that they will deliver electricity to every house within three years. The Congress continued to advocate the promise of providing electricity to every household like Garibi Hatao: Prime Minister Shri Narendra Modi. In the Commonwealth Games in Delhi, our players were working hard to win the medal and the people of Congress were making their wealth: Prime Minister Shri Narendra Modi. Under the Mudra scheme, we have given 7 lakh crore rupees without any guarantee for self-employment: Prime Minister Shri Narendra Modi. Congress Party does not want our air force to be strong: Prime Minister Narendra Modi. People who have fled from the country are crying on Twitter that I had taken Rs 9,000 crore, but Modi ji seized my 13 thousand crores: Prime Minister Shri Narendra Modi. The Congress was insensitive for the defense personnel. For 10 years, they were government, they did not pay any attention to the demands of the Army, Air Force, and Navy: Prime Minister Shri Narendra Modi. Congress does not want the country's air force to be strong. Congress wants a good company to cancel Rafael deal: PM Modi. History is witnessed that the Congress party and its UPA government did not work without the brokerage in defense deals: Prime Minister Shri Narendra Modi. During his 55-year tenure, no defense deal was done without brokering: Prime Minister Narendra Modi. In our government, more than 20,000 organizations in this country closed their shops, who brought money from foreign countries and used to harm Hindustan: PM Modi. The law was made long ago on the property of Anonymous but debated it in Parliament and this was going on for votes. When we came to power, we implemented the law and now the benami property is coming out and they all know where and where they are coming from: PM. # After 55 years of power, some people consider themselves as an emperor. Everyone views them as worthless, humiliating everyone has become their nature: Prime Minister Shri Narendra Modi. Conflicts of constitutional institutions, dynasty and corruption have also been accepted by the Congress colleagues. Because culture has become for them: PM Modi. Baba Saheb had said that joining Congress would be like suicide: PM Modi. Mahatma Gandhi had understood a long time ago and he had said that the Congress should scatter. That is why I am doing this work because Congress-free India was not my dream of Mahatma Gandhiji: Prime Minister Shri Narendra Modi. 99% of goods after GST has come under the purview of 18% or less: PM Modi. We reduced the interest on education loan from 15% to 11%. Likewise in the loan on housing, the savings of 5 to 6 lakh rupees are now being saved by the middle-class family in the bank: Prime Minister Shri Narendra Modi. Due to the LED bulb, the electricity bill of 50 thousand crore rupees has declined in the country. Which is being spent in the poor and middle-class welfare: PM Modi. Our government is working for the good health and well-being of the people of the country. Prices of heart stent, knee surgery and medicines are continuously decreasing. Whereby poor people are being helped by the poor: Prime Minister Narendra Modi. Who previously waited for death because of poverty, but could not go to the hospital. Now after the Ayushman Bharat Scheme, about 11 crores poor have treated their patients: PM Modi. By amending the Constitution, we have given the opportunity of fulfilling dreams for the common poor youth of the country. 10 percent reservation for the common poor without putting the benefits of SC-ST: PM Modi. In our country, about 65 lakh people were registered in National Pension System (NPS) in March 2014. In October last year, this number has increased to about 20 million. Has this been done without a new job ? : Prime Minister Narendra Modi. According to an estimate, in the last 4 to 4 years alone 1.25 crore people have got new opportunities in the transport sector: Prime Minister Narendra Modi. The country is robbing the country, now roaming on Twitter: PM Modi. We are busy in fulfilling the hope of common man by challenging the challenges: PM Modi. The true speaker also speaks the truth and speaks the truth even inside: PM Modi. According to an estimate, in the last four and a half years alone, 1.25 crore people have got new opportunities in the transport sector alone: Prime Minister Narendra Modi. In the last 4 and 4 years, the number of approved hotels has increased by 50%. Those hotels are also giving jobs, but no one gets the attention of this: Prime Minister Shri Narendra Modi. We have completed spending thousands of crores of rupees to 99 irrigation projects which have been hanged for years: Prime Minister Shri Narendra Modi. Like the Garibi Hatao, the promise of electricity will be extended by Congress: PM Modi. Witnessed the exploits of the Milawati government, but now it is being prepared for Maha Milawat: PM Modi. Congress 55 years and our 55 months: PM Modi. Our friends in Congress see things in two time periods. BC- Before Congress, when nothing happened. I will not allow any sun to sink: PM Modi.